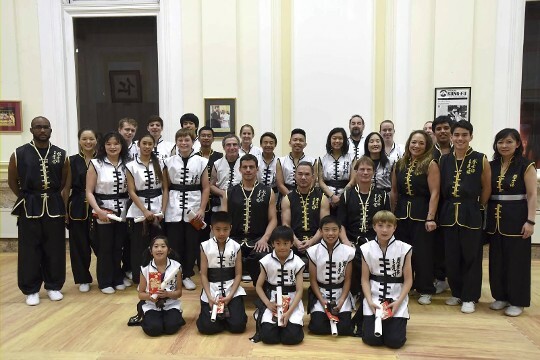 On Saturday, November 6th, more than 20 students of the Bay Area’s Tat Wong Kung Fu Academies gathered for our 2015 Fall Black Belt Test. Thirteen had come to earn their very first Black Belts; four had returned for their 1st Degrees, and five for their 2nd Degrees, one for their 3rd Degree, two for their 4th Degree, and one for 5th Degree. Throughout the day-long test, our headquarters school in San Francisco resounded with the ‘aiyahs’ of our candidates. The sifus led them through weapon sets, hand forms, rapid combinations, self-defense, and they ended with endurance and board-breaking. We had a number of our teaching staff test this time around. Sihing Ken has attained the 5th Degree, Sihings Clinton and Morgan both reached 4th Degree, and Sijeh Denise got 2nd Degree. Testing with Denise, was her nephew Alex, who joins his father as Black Belt in our Concord academy. Kung Fu is a great family activity! Afterwards, family & friends gathered for the evening’s Traditional Tea Ceremony with Master Jeff Chow. Candidates served tea to Master Chow, and received their belts and some words wisdom.